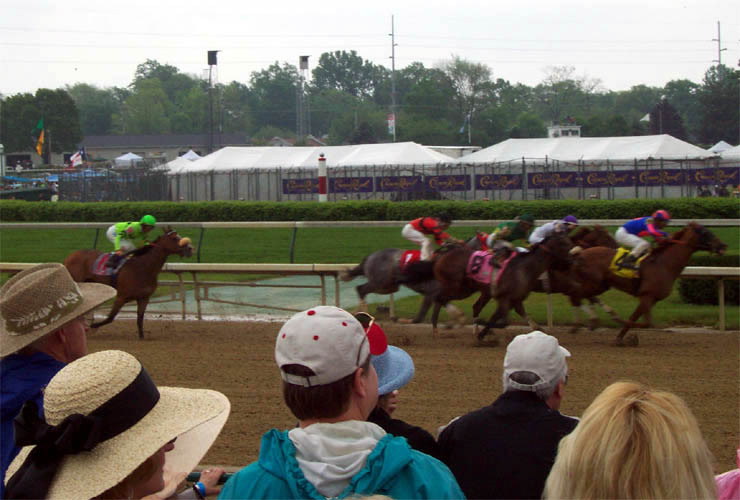 I had visited Churchill Downs back in the 1960s, but saw my first Kentucky Derby in 2004. The photos below do not give an accurate impression of the rain. It rained a lot and there were a number of rain delays. 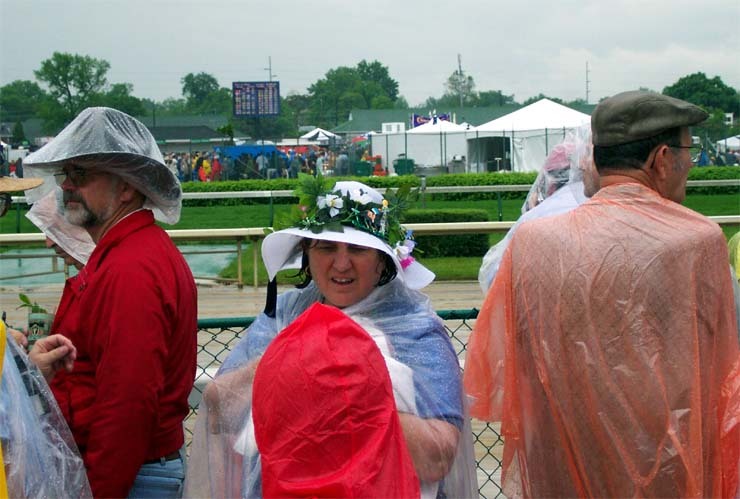 Many women were dressed up for the Derby in new bonnets. 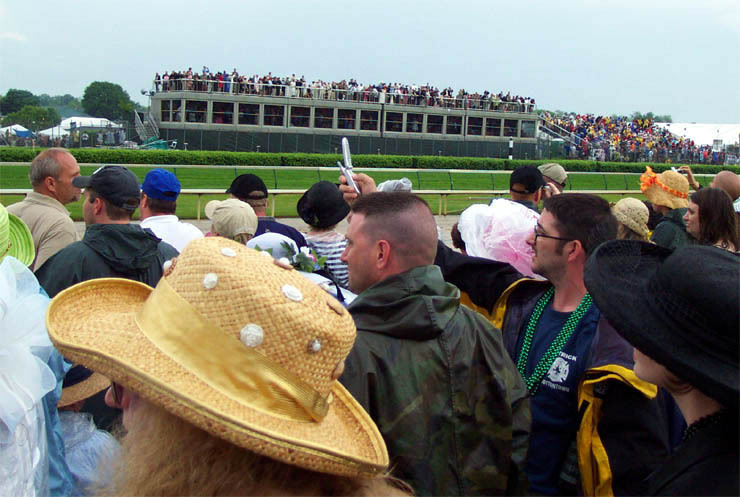 This is part of the grand tradition of the Derby. Since this was 2004, security was tight. Everyone was searched. I had to spread my legs and was aggressively "patted down". It hurt! 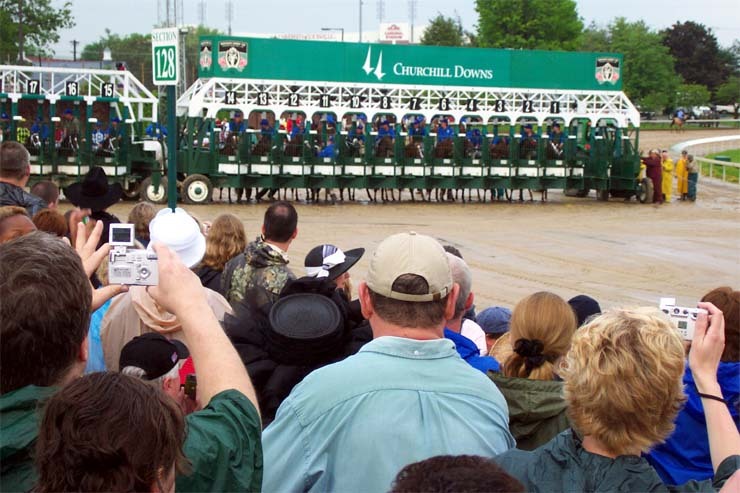 Churchill Downs is in the middle of a reconstruction. The famous roof line, dominated by the twin steeples, is no more. New construction with skyboxes towers above the old roof line. At this point in the construction, the number of television monitors was insufficient for the crowd. 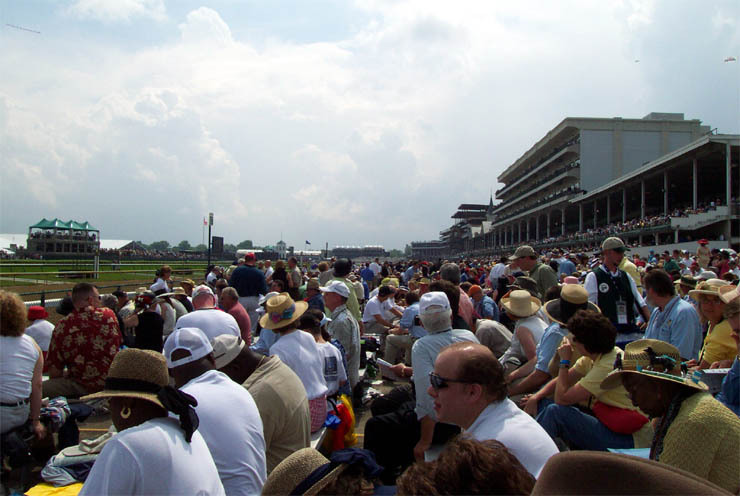 There are two basic crowds at the Derby: people in expensive seats in the grandstand watching the races and people in the infield drinking with their friends. Everyone was excited about the prospect of Derby day. 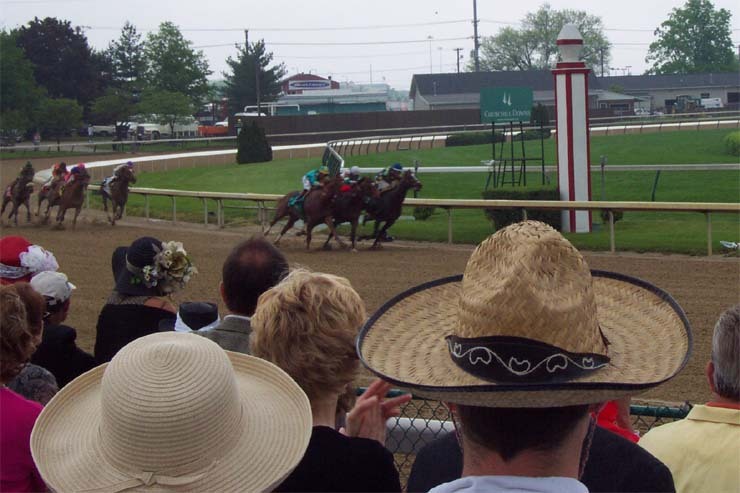 Smarty Jones, who was undefeated, won the Derby. 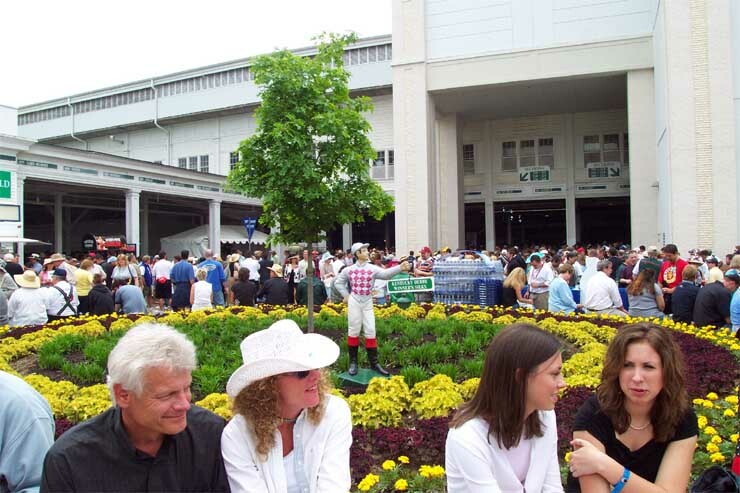 Part of the entrance to Churchill Downs. The paddock is very active with people and the media. Hard to take photos with the bonnets. 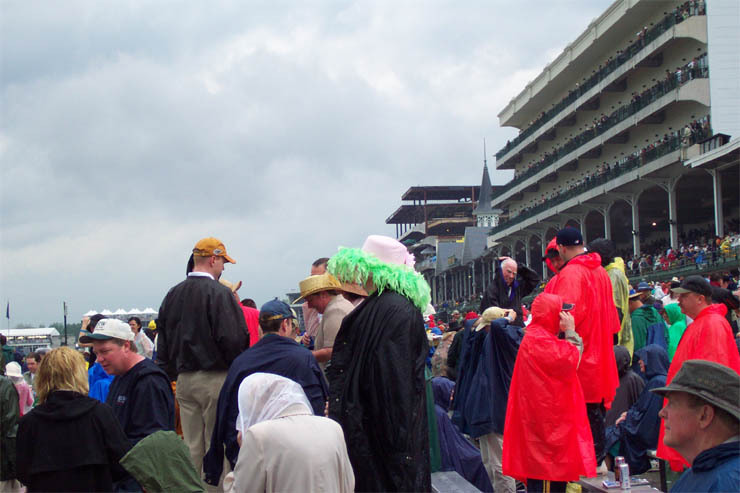 The infield got muddy later, but the party-going crowd didn't mind. 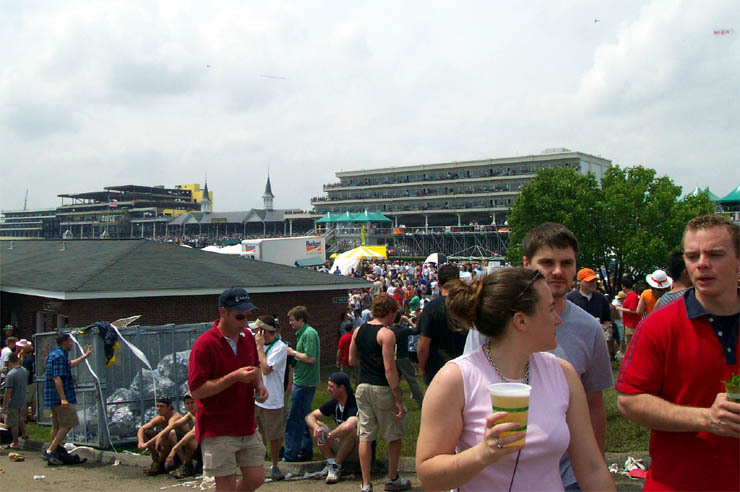 A view toward the finish line with the grandstand on the right and infield on the left. It's tricky to wear a new bonnet on a rainy day. Sometimes it rains before you can cover your bonnet! Here they are at the top of the stretch racing toward the finish. Here they are during the exciting stretch run. 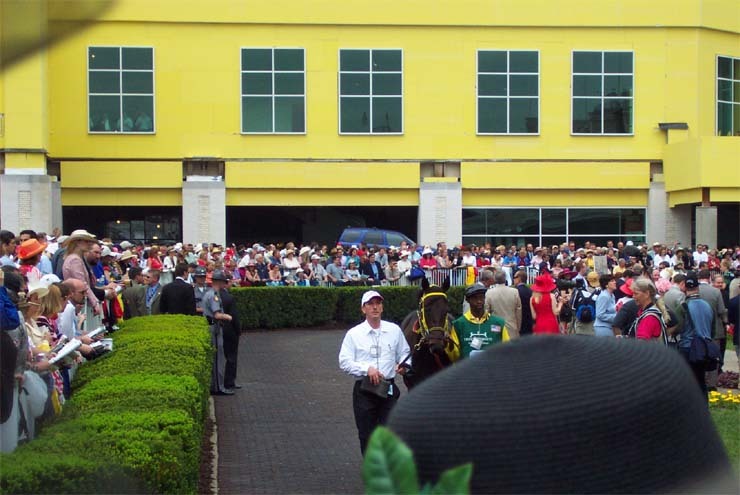 Everyone wants to get a photo of the start of the Kentucky Derby! If you forgot your camera, use your cell phone. Can you see the 8 bonnets in this photo? Copyright © 2004 Donald M. Parrish, Jr. All rights reserved.